Most methods of phylogenetic analysis deal with simple trees. In these phylogenies, every taxonomic unit has a single direct ancestor (or “parent”). But we know that phylogeny is often more complex than this. Our own species is an excellent example—while we are all primarily descended from one population in Africa, different peoples around the globe have inherited smaller percentages of ancestry from preexisting populations. A new study by Reich & al. looks in some detail at peoples who have inherited DNA from the Denisovans, a fossil group known from Siberia. Ancient DNA has been retrieved from these fossils, although unfortunately the fossils are otherwise too scant to tell us much about what Denisovans looked like (other than “humanlike”). Reich & al. posit a complex phylogeny wherein populations are often descended from multiple ancestral populations. Lets take a look at the clades posited in this study. Reich & al. used the following nine populations, seven extant and two extinct, as operational taxonomic units. Han.—The most populous Chinese ethnicity. Mamanwa.—One of the “Lumad” (“indigenous”) ethnicities of the southern Philippines. Jehai.—One of the Orang Asli (“original people”) groups of Malaysia. Note: this photo is of a woman from a different Orang Asli tribe, the Batik. Onge.—A group of Andaman Islanders, from the Bay of Bengal. Australians.—The indigenous (“aboriginal”) peoples of Australia. Papuans.—The indigenous peoples of the New Guinean highlands. Neandertals.—An extinct group of robust near-human peoples from West Eurasia. Denisovans.—An extinct group of near-human peoples known from Siberia but thought to have had a wider range. Note: The photo is of a sculpture of Homo heidelbergensis, thought to be the common ancestor of humans, Neandertals, and Denisovans. Denisovans may not have looked exactly like this. Reich & al. postulated the simplest phylogeny that could possibly explain their data. (Note that the actuality is likely more complex than this, but it’s a good starting point.) More recent groups are to the right, and the thickness of the lines indicates the percentage of DNA contributed from population to population. My diagram, not theirs. Any inaccuracies are my own. Free for reuse under Public Domain. I’ve added a line for the Denisovans’ mitochondrial (motherline) ancestor, even though it’s not part of the paper’s phylogeny. More on that as we start looking through the various clades. For looking at the clades I’ll use a different diagram that does not reflect percentage of ancestry, but simply shows direct descent as unweighted arcs connecting parent and child taxonomic units. 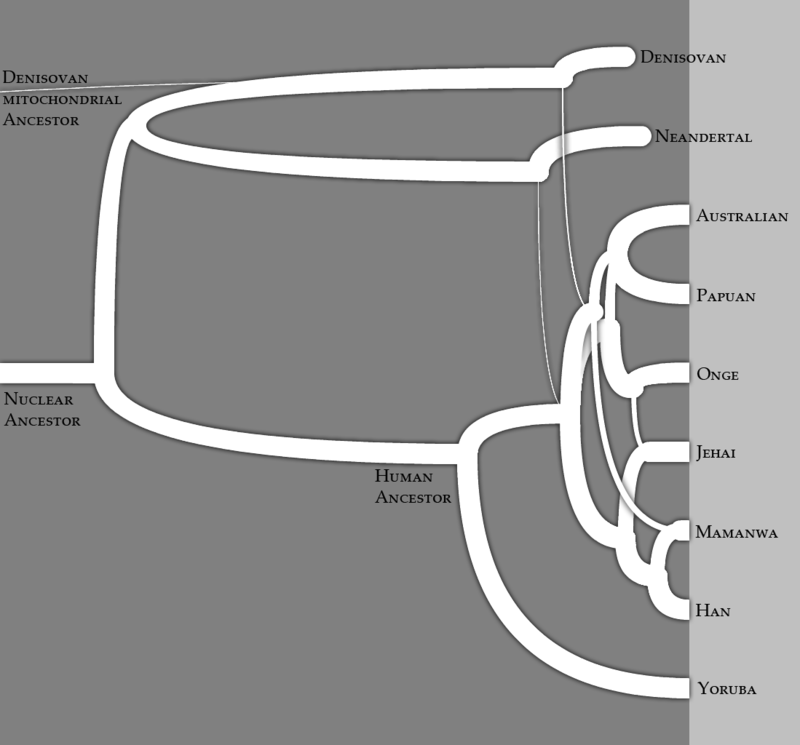 Phylogeny of human and near-human populations according to Reich & al. 2011. Created using Names on Nodes. Technically, every terminal node is itself a clade, at least in the context of the phylogeny. So the first nine clades are the nine operational taxonomic units, each consisting of an ancestor (the taxonomic unit) and all of its descendants (vacuous, as there are none). Now on to the larger clades, starting with the largest. Mitochondrial DNA Crown Group.—Although most Denisovan DNA shows shared ancestry with Neandertals, exclusive of humans, the mitochondrial DNA tells a different story. Denisovan mtDNA diverged from human-Neandertal mtDNA a very long time ago, perhaps around a million years ago.So we begin with this, the oldest clade of the human total group wherein mtDNA is known for all direct sub-branches. From the timing, the ancestor of this clade might be Homo antecessor or a similar contemporary. There are two main branches that we know of: one which produced Neandertals, humans, and the nuclear component of Densiovan ancestry, and the other of which produced the mitochondrial component of Denisovan ancestry. Perhaps as Denisovans migrated eastward over Asia they mated with the females of another lineage. Nuclear DNA Crown Group.—This is the oldest clade represented by nuclear DNA, roughly 400 millennia old. The ancestors of this clade would probably be classified as Homo heidelbergensis. Two major subclades are known: one leading to humans and the other to “archaic” Eurasians (Neandertals and Denisovans). Strictly speaking, there is an even older nuclear ancestor, since another study indicates that some South and Central Africans inherited some nuclear DNA from an ancestor that split off around 700 millennia ago. But those populations aren’t covered by this phylogenetic hypothesis. Eurasians.—This clade originates from an ancestor around 350 millennia ago. The two major subclades are Neadertals and Denisovans, but it also includes non-African humans, which are partly descended from Neandertals (and, in some cases, Denisovans as well). Humans.—Humans (in the strict sense) are a crown group that originated in Africa roughly around 200 millennia ago. Some, such as the Yoruba, are descendants of those who stayed in Africa. Those who left Africa, into Eurasia, mixed with the “archaics” already living there. Eurasian Humans.—Eurasian humans are mostly descended from early African humans, but have inherited 1–4% of their DNA from Neandertals. “Denisovoid” Oceanian.—The indigenous peoples of Oceania, not the later Austronesians, Chinese, Europeans, etc. (except insofar as they overlap, e.g., in the Mamanwa). This includes the indigenous peoples of Australinea (Australia + New Guinea), the Philippines (Lumad peoples—Mamanwa, Monobo, etc. ), the Lesser Sunda Islands (Alor, Flores, Roti, Timor, etc. ), Melanesians (Fijians, etc. ), and Polynesians. 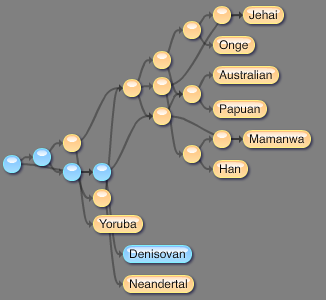 All of these peoples are part of other, overlapping human clades as well, but all of them have some percentage of Denisovan ancestry. The highest percentage (~5%) is found in Australinea. Reich & al. postulate that the original admixture level was even higher (~7%), but was diluted by later waves of Australoid and Mongoloid peoples, the former contributing to the ancestry of Australineans and the latter contributing to the ancestry of Lumad Filipinos (such as the Mamanwa). 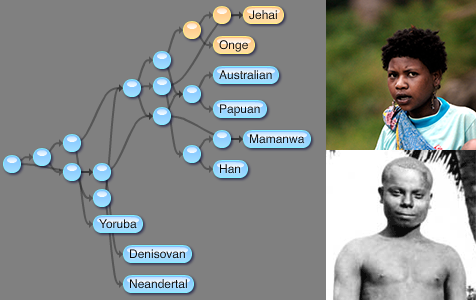 Australoids.—Australineans share an ancestral component with West Negritos such as Andaman Islanders (including the Onge) and Orang Asli of Malaysia (including the Jehai and Batik). This corresponds fairly well to the old idea of an Australoid race, although the Andamanese are actually a purer representation than Australians, who are roughly half “Denisovoid” Oceanian, so “Andamanoid” would be a better term (oh well). Orang Asli peoples are also part Mongoloid (see below). Australineans.—This clade originated with the first settlers of New Guinea and Australia, which were joined as one landmass at the time, due to low sea levels. This landmass is variously called Australinea, Meganesia, or Sahul. 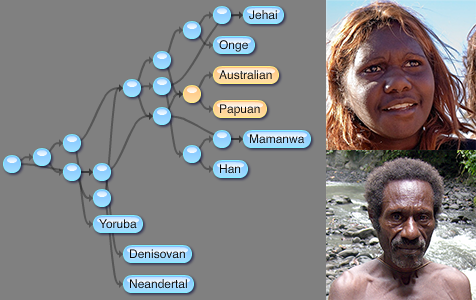 These peoples are roughly equal parts “Denisovoid” Oceanian and Australoid. West Negritos.—”Negrito” is general term for the dark-skinned, often diminutive peoples of Southeast Asia and Oceania. 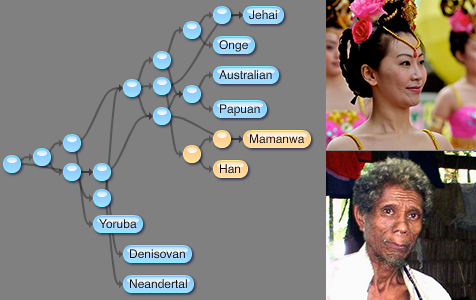 They do not really form one group, but the West Negritos, as represented by the Orang Asli (Jehai, Batik, etc.) 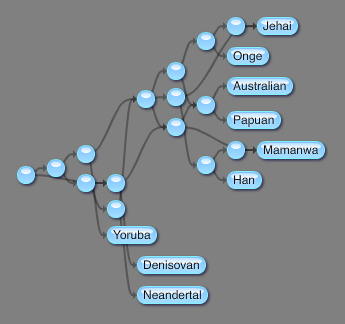 and the Onge, share an ancestral Australoid component. Mongoloids.—These peoples originated in East Asia. Reich & al. find two major subclades. One includes the Orang Asli peoples of Malaysia (such as the Jehai and Batik), who are also part Australoid. The other leads to Chinese and Filipino peoples. “Sinoids”.—Traditionally “Sinoid” is a synonym of “Mongoloid”, but here I am using it for the subclade of Mongoloids including Chinese and Filipinos. Indigenous Filipinos (Lumad peoples, such as the Mamanwa) are also part “Denisovoid” Oceanian. Clades with Multi-Unit Cladogens.—This is a clade. One of its possible definitions is branch-based: the clade stemming from the initial ancestor of Australians and Han Chinese which was not also ancestral to [late Siberian] Denisovans. But if you look closely, there’s something odd about this clade (my apologies that it’s not a bit easier to see). Namely, the “ancestor” of this clade is two taxonomic units! One is the “Neanderthaloid” ancestor and the other is the human ancestor. But isn’t a clade supposed to be “an ancestor and all of its descendants”? Well, as I discussed in my 2007 paper and more recently on Names on Nodes, we need to define exactly what we mean by “ancestor”. I define a clade ancestor, or cladogen, as a union of one or more taxonomic units wherein 1) none of the units are ancestral to each other, and 2) there exists at least one other unit which is descended from (or equal to, in case the cladogen is a single unit) all of the units in the cladogen. The union of the ancestral populations of “Neanderthaloids” and humans, respectively, satisfies these conditions. They can be seen as part of a population that does not include the Denisovans, since they share descendants that do not have Denisovan ancestry (including, e.g., the Han, West Negritos, … and myself!) So, even though they consist of two units in this study, they still comprise a population and can be used as a clade ancestor. Studies like this one may seem to some to test the usefulness of phylogenetic nomenclature, since it features clades that overlap. In fact, phylogenetic nomenclature has always allowed for overlapping clades. It is phylogenetic analyses that routinely assume no overlap. In many cases this is useful, but I tend to wonder if it doesn’t obscure our vision in a lot of cases. Studies like this one are encouraging to me, since they move toward embracing the fact that Life is not a simple tree.